your shoes ready for your gown fitting and the hemming of your gown.. Please do not hesitate to contact me to help you with sizing and styles..
Also have a look at the beautiful matching clutches and Evening Bags on our site. Wedding Party in Photo are wearing Lilly Champagne, Kyra White. 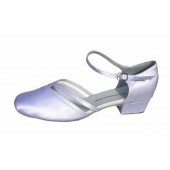 Heel Height: 1.5 inch - 6.5cm WHITE PLEATED SATIN / SILVER - T-Bar Strap and Peep Toe..
Heel Height: 2.5 inch - 6.5cm WHITE PLEATED SATIN / SILVER - T-Bar Strap and Peep Toe..
HEEL HEIGHT 1.5in - 4 cm Ivory satin with silver sparkle, TRUE COLOUR is slightly mo..
HEEL HEIGHT 2.5in - 6.5 cm Ivory satin with silver sparkle, TRUE COLOUR is slig..
Heel Height: 2.5 inch White Satin with beautiful Swarovski Crystals - Cross T-Bar strap, Sued..
Gabriele White shoes is a traditional style and are White satin covered with a White Sparkle trim..
Georgia is a closed toe, low heel slightly darker ivory shoe. 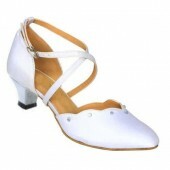 Features delicat..
Georgia is a closed toe, low heel ivory shoe. 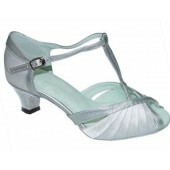 Features delicate satin pleating..
Heel Height: 1 inch White Satin fabric/white trim- Closed toe - Ankle strap, Suede Sole ..
Heel Height: 1.5 inch - 4 cm This shoe is set off by the elegant diamante detailing srou..